Oriented Strand Board (OSB 3) or Waferboard. Strand Board or OSB Oriented Strand Board is manufactured with exterior quality resin glues that make it the board of choice for many building requirements. The product is manufactured worldwide. 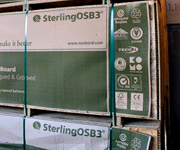 Our main OSB brands in stock are Smart Ply & Sterling Board. Smartply is manufactured using three layers of wood strands coated with waterproof resins. The strands are layered in specific directions to build up a lattice pattern through the sheet structure and then bonded under heat and pressure to make a strong, rigid board with good moisture resistance. Packing Crates - Shuttering or Formwork.